Countdown To Gotham Part 3: We're Almost There! We’re almost there! Just one more day before the Gotham Season 2 premiere, and we’re here to deliver the last bits of news before the show starts! Content/trigger warning for death, violence, and blood. Before we delve into the news for season two, there’s a couple pieces of news regarding last season. First, you can now own Season One of Gotham on DVD and Blu-Ray! Besides the original 22 episodes (and an extended version of the pilot), you also get over 2 hours worth of special features, including a gag reel, deleted scenes, character profiles, multiple making-of featurettes, and a short documentary about how Oswald Cobblepot’s rise to power symbolizes the strategic game of chess. 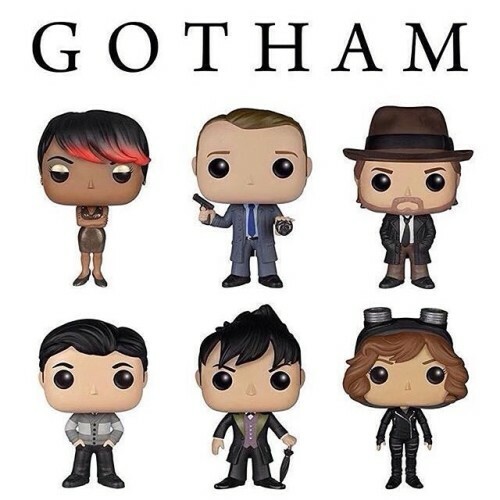 Second, for you collectors out there, six of your favorite Gotham characters will be released as Pop Vinyl figurines this October. Onto the news for Season Two! Lots of new promos and sneak peeks have been released lately. Check those out below. From these previews, as well as some recent interviews, we can glean a lot about the upcoming episodes of Gotham. We can see more of Eddie’s struggle with his alternate self. A possible romance between Barbara and Tigress. Barbara and Jerome causing havoc at a magic show that has apparently been taken over by their crew. We also see glimpses of Lee hiding in a morgue, as well as being held captive at the magic show. Mark Margolis will be returning as the blind fortuneteller, Jerome’s father, Paul Cisero in episode 3. We can see more of Jerome burning down the children’s school bus. And it looks like we’ll even get to see the Baby Batman and Baby Joker together for the first time, as Jerome seems to be holding Bruce Wayne hostage as well. We can also see some other interesting things, such as Tigress fighting Jim Gordon. And what appears to be Oswald’s new disguise. Robin Lord Taylor recently revealed that his mother will be the target of the Galavans this season. He told comicbookresources.com that “Theo and Tabitha disrupt the entire power structure in Gotham. They make a big move in Season 2 that throws everyone off. They are very reminiscent of what Oswald did in the first season. It's almost like Oswald is getting a taste of his own medicine. 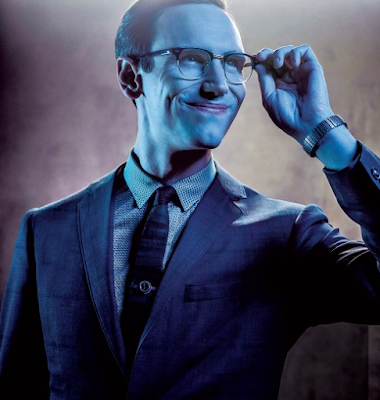 Someone comes in with an agenda that no one was expecting to see, and it just throws everyone off balance.” It'll be interesting to see what Oswald does now that his mother's life is in danger. 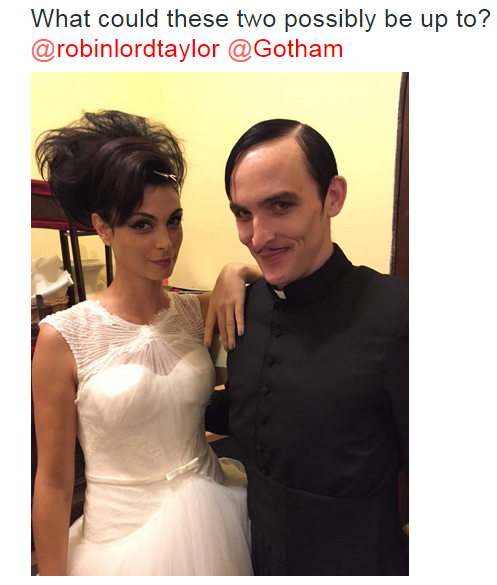 Actress Morena Baccarin posted a very interesting picture of her character and Oswald to Twitter recently. And Killer Croc has been announced as another villain that will be appearing in Season Two. In other news, DC head Diane Nelson told Variety they are keeping DC shows separate from the DC film universe, and that Gotham has absolute creative freedom. The first three or four episodes will focus on Jerome and his gang, which appears to be called the Maniax. The two episodes after that will be a two-parter about new villain Firefly. Ep. 1: Damned If You Do – Airs Sept. 21. Ep. 2: Knock Knock – Airs Sept. 28. Ep. 3: The Last Laugh – Airs Oct. 5. Ep 4: Strike Force – Estimated airdate: October 12. Ep 5: (title unknown - Part 1 of a Firefly two-parter) Estimated airdate: October 19. Ep 6: By Fire (Part 2 of a Firefly two-parter) Estimated airdate: October 26. And that’s the last of the news! Next week, we begin our official Gotham Recaps of Season Two. And remember to watch the Gotham Season Two Premiere tomorrow night on Fox!